Instead the British resolve to capture German East Africa was to be implemented with an amphibious attack on Tanga. Unlike the plan on paper however, the attack turned into a debacle. On 2 November 1914 the British cruiser HMS Fox arrived. The ship’s captain, Commander F.W. Caulfield, went ashore giving Tanga one hour to surrender and take down the imperial flag. Before departing he demanded to know if the harbor was mined; it was not, but he was assured that it was. After three hours the flag was still flying and Fox departed to bring in the Force “B” convoy of fourteen troop transports. This gave time for both the Schutztruppe and the citizens of Tanga to prepare for an attack. 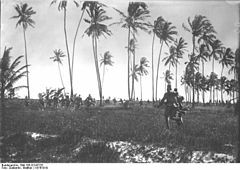 The German commander, Lieutenant Colonel Paul Emil von Lettow-Vorbeck rushed to Tanga. He reinforced the defences (initially only a single company of Askaris) with troops brought in by rail from Neu Moshi, eventually numbering about 1,000 in six companies. Captain Caulfield ordered the harbor swept for mines during 2 November and well into the next day. During the sweeping the Force “B” commander, Aitken began the unopposed landing of troops and supplies in two groups, at the harbor and three miles east of the city on a minefree beach. By evening on 3 November the invasion force was ashore with exception of the 27th Mount Battery and the Faridkot Sappers. At noon in 4th November, Aitken ordered his troops to march on the city. Well concealed defenders quickly broke up their advance. The fighting then turned to jungle skirmishing by the southern contingent and bitter street fighting by the harbor force. The Gurkhas of the Kashmiri Rifles and the 2nd Loyal North Lancashire Regiment of the harbour contingent made good progress and entered the town, captured the customs house and Hotel Deutscher Kaiser and ran up the Union Jack. But then the advance was stopped. Less well trained and equipped battalions of the Imperial Service Brigade scattered and ran away from the battle. The 98th Infantry got attacked by swarms of angry bees and broke up. The bees attacked the Germans as well, hence the battle's nickname. British propaganda transformed the bee interlude into a fiendish German plot, conjuring up hidden trip wires to agitate the hives. The 13th Rajput Rifles did next to nothing to the battle as their morale had been shaken when witnessed the escaping of the 63rd Palamacottah Light Infantry. 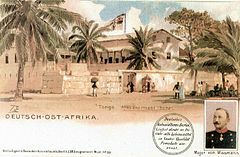 The successful defence of Tanga was the first of many achievements of Paul von Lettow-Vorbeck during his long campaign in East Africa. For the British however the battle was nothing short of a disaster, and was recorded in the British Official History of the War as “one of the most notable failures in British military history.” Casualties included 360 killed and 487 wounded on the British side; the Schutztruppe lost 16 Germans and 55 Askaris killed, and 76 total wounded. Farwell, Byron. The Great War in Africa, 1914-1918. New York: W. W. Norton & Company, 1989. ISBN 0-393-30564-3. Paice, Edward. Tip and Run: The Untold Tragedy of the Great War in Africa. London: Weidenfeld & Nicolson, 2007. ISBN 0-297-84709-0.